To the layperson, the process a physician follows on the way to a diagnosis looks like a black art. Diagnostic machinations are riddled with complexity, darting from one possible byway to another, before eventually choosing a small twig from the arcane depths of the forest, diagnosis making hides its scientific basis like a shy teenager with good exam marks. By implication, this entails objective assessment of a patient’s subjective experience of the disease process. The diagnostician must therefore enter into, analyse and make sense of the patient’s account. Given the relevant detail that must be sifted from irrelevant background information, the diagnostician is by definition a puzzle solver who must start with the working hypothesis that all is potentially relevant until shown otherwise. The puzzle-solving dimension of diagnostic process was previously demonstrated by analogy through the use of a well-known computer game (Myst). The recent release of a finely illustrated iPod version of the computer game; Machinarium, brought the concept to another generation of students of diagnosis. 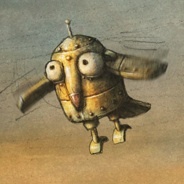 Machinarium provides hours of in-depth hypothesis testing, but differs from Myst in its lighter humour. The two puzzle-solvers share the central idea of assembling a story by exploration and experiment. Interestingly, they also share the use of external reference texts to help the traveller on his way, so that the problem-solving process is much more multi-layered than a modestly interactive version of Where’s Wally?. There is a deep-running stream in this that taps into the quest narrative. Lewis Carroll famously lampooned the idea in his nonsense poem; the Hunting of the Snark, which was composed in reverse, starting with the last line: ‘for the snark was a Boojum, you see.’ We could have endless fun exploring the relevance of Carroll’s verse to contemporary issues including emerging infectious diseases and hospital infection control. But on this occasion, the MicroGnome will not try his reader’s patience any further. Suffice to say that Carroll was quite clearly an early student of complexity, long before it had received serious attention outside the field of mathematics. The biomedical world has shifted almost imperceptibly on its axis in the last couple of decades, absorbing a new set of core paradigms. You can measure the magnitude of this shift in the second edition of Bechtel & Richardson’s Discovering Complexity. Their choice of examples from investigative fields as diverse as genetics, cognitive neuroscience and cell biology illustrate how far biomedical hypothesis generation has come from its modernist past. If all this seems a bit abstract for the jobbing diagnostician, remember how much hypothesis generation and testing is now underpinned by laboratory or imaging studies. Assess-Investigate-Decide-Act (AIDA) is the short form, or as previously asserted; it’s all over when the fat lady sings. And for Gen-Y, surely the preferred skills development is to flick open the tablet computer and go on a hunt for snarks? There is more complexity (and more fun) in the Snark than you think. As a Gen-Y-er myself, I agree – it is more fun to hunt snarks than participate in endless PBLs on clinical reasoning. I have a feeling that both would be required to maximise our development of good clinical reasoning though.